Two scoops of custard, hot fudge, a mix of candy toppings with whipped cream and a cherry. Vanilla, Chocolate, Strawberry, Blueberry, Raspberry, Banana, Caramel, Pineapple, Peanut Butter, Cappuccino, Oreo, Root Beer or Create Your Own. Six Scoops of Custard and 3 Toppings of your Choice (Traditional - Chocolate Syrup, Pineapple and Strawberry Topping) Banana, Whipped Cream and 3 Cherries. Three Scoops of Custard and 3 Toppings of your Choice (Traditional - Chocolate Syrup, Pineapple and Strawbery Topping) Banana, Whipped Cream and a Cherry. A warmed Brownie between Two Scoops of Vanilla Custard, Hot Fudge, Whipped Cream and a Cherry. Three Scoops of Vanilla Custard, Hot Fudge, Hot Caramel, Pecans and Whipped Cream and a Cherry. A warmed Yellow Cake between Two Scoops of Vanilla Custard, Strawberries, Whipped Cream and a Cherry. Three Scoops of Vanilla Custard, Hot Caramel, Cashews and Whipped Cream and a Cherry. A warmed Apple Dumpling between Two Scoops of Vanilla Custard, Hot Caramel, Whipped Cream and a Cherry. Choose One of Our Featured Essential Oils and Blend it with Your Choice of Custard. Choose from Lemon, Ginger, Peppermint, Wild Orange or Grapefruit. Flavors will Vary. All cakes are made with one layer of Vanilla custard and a layer of Chocolate custard with a Oreo Cookie crunch filling. A small treat for your best furry friend! Once small scoop of Vanilla Custard with a treat on top! Vanilla, Chocolate, Mix & Italian Ice Toppings Price – based on number and choices. 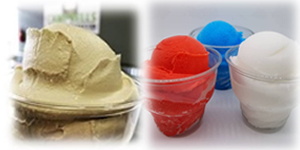 Additional cups are $5.00 each Choice of Vanilla, Chocolate, flavor of the day or Italian Ice + one topping per cup. 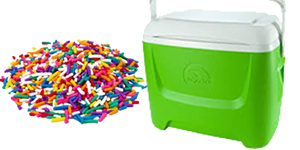 Vanilla, Chocolate, Mix & Italian Ice Toppings Price – based on number and choices. Custard by the gallon – You scoop and we provide you with scoops, toppings of your choice and coolers. Please call for pricing. You have an idea, contact us and we would love to make your dreams a reality! 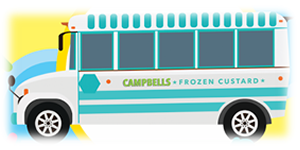 Campbells Custard is a family owned, independently run Frozen Custard store. Formerly known as BR Frozen Custard & Sweets, we purchased the business in the summer of 2015 and re-branded to Campbells Custard in the summer of 2016. We offer Vanilla and Chocolate custard every day, and change our other two special flavors every other day! 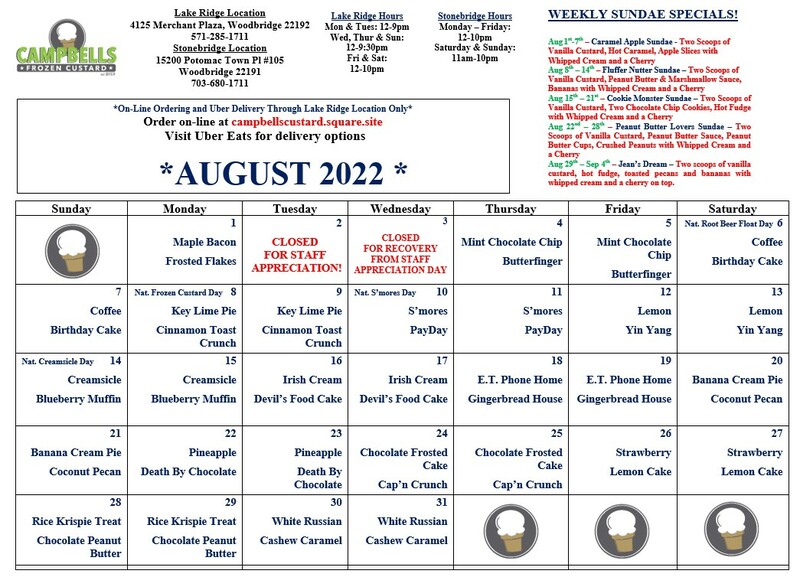 Check out our Flavor Calendar to see what the flavors are today! Our custard is run fresh every day, throughout the day to provide you with the ultimate taste experience. © Campbell's Frozen Custard, All rights reserved.